Follys End is a family campground "offering isolation in a scenic setting"1. Alongside Elk Creek, Pennsylvania's largest Lake Erie tributary, and down about 100 feet in the creek gorge we offer an abundance of natural beauty including two waterfalls and a challenging 1.5 mile loop hiking trail. We have a full-line Fly and Tackle Shop with all the usual camping supplies including wood and ice. 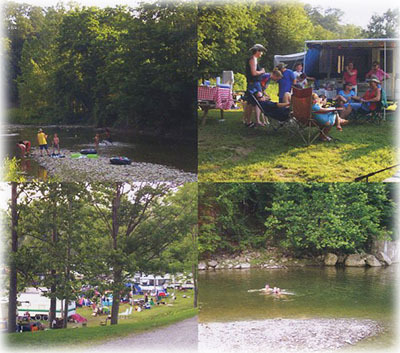 The famous Lake Erie tributary, Elk Creek, runs alongside our campground. Enjoy spectacular steelhead fishing from September through April. Access to other tributaries and Lake Erie is minutes away.